Nothing Illegal About MSEB Android App Says App Developer! 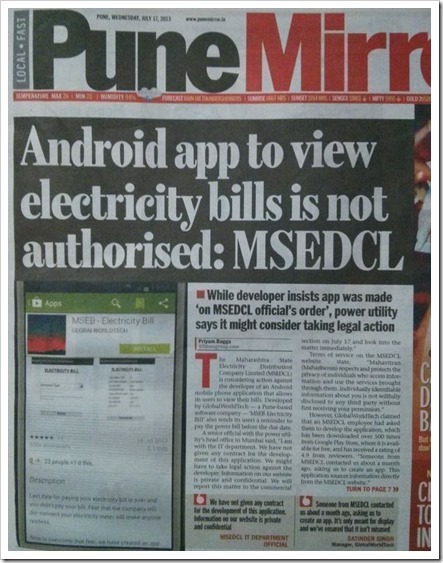 Pune Mirror, a Pune based daily from Times of India group today carried a story on MSEB Android App, which it termed to be illegal and unauthorized. The article also mentions that developer had developed the Android app on MSEDCL’s official order. Here is the screenshot of the story carried by Pune Mirror today. The app was removed from the play store today and currently is not available. The app was launched on July 5th, and was approaching around 500 downloads till date. I had downloaded this app when it was first launched on June 5th, and I had myself wondered whether this was an official app from MSEB. But, after seeing the developer name, I came to know that it was developed by third party developer. MSEB on their website provides exactly what the app said app provides – Viewing of bill based on consumer number and their billing unit. After seeing the article today on the front page, I was quite surprised that Pune Mirror chose to write about the app in negative light. The reason being, there is no way that the company is compromising any user data. If someone wants to see their MSEB bill, they need to have their unique electricity consumer number along with their billing unit number. And these details are available with the MSEB subscriber. Whereas the Pune mirror article points out user data may get compromised due to this App. We spoke to Satinder Singh, Founder of GlobalWorldTech, company which developed this app in regards to the nature of their app. Here is the audio of our conversation. Like I have mentioned to Satinder, it is surprising that GlobalWorldTech chose to bring down their app. In my view, if they have not done anything illegal or wrong, they should have kept the app online. Removing app from the app store just shows that they have done something they should not have done. Having said that, I am also surprised that Pune Mirror decided to attack this app without investigating it further. "Nothing Illegal About MSEB Android App Says App Developer! ", 5 out of 5 based on 1 ratings. Our app is up again. I agree that the MSED site itself allows access through the consumer number so no reason for MSED to worry about data privacy issue. If there is a privacy issue it exists already. For eg. electricity bills are just jammed into mail boxes in my society. I could pick any of them, note down the consumer number and then check that persons bill status on the net through MSED’s own portal. I think this is a storm in a teacup kicked up by a reporter who has not done enough research into the matter. As far as MSED concerns go, I hope their IT partners can explain that such apps will just help people get more info and it will just help in timely bill collection for them. The whole article is a shame, I used this app and it was so convenient and Pune Mirror put it in such a negative light. There were comments from two other companies, that looked like it was an advertisement for those. I understand Satinder, you just don’t want to mess with any press or govt. dept. This is another idiotic stance from MSEB. But in any case, I wonder whether or not we need access to the API to be able to create it?